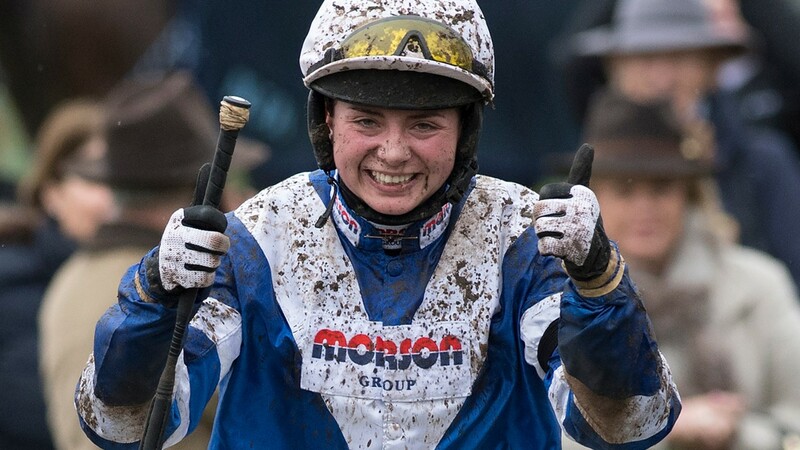 A female champion jockey could be crowned in the next five years believes BHA chief executive Nick Rust as he responded to an academic study that showed women are the equal of their male counterparts in the weighing room. Rust committed the organisation to finding positive ways to promote opportunities for female jockeys but appeared to rule out the adoption of an equivalent to France's weight allowance and said that any incentive would not compromise the principle of riding "on equal terms". The detailed statistical analysis covering 14 years of data and more than 1.25 million rides concluded that, once the quality of rides was factored in, the performance of female jockeys was no better or worse than male jockeys. With 11.3 per cent of professional jockeys licences held by women who in turn took just 5.2 per cent of the rides during the period of the analysis, the BHA said it would consider the study's findings as it looks to determine what steps should be taken to eliminate the prejudice against female riders. The study has been written by Northern Racing College work-based learning manager Vanessa Cashmore, who recently graduated from the Thoroughbred Horseracing Industries MBA which is run by the University of Liverpool with funding from the BHA and Racing Foundation. Using statistical methods to control for quality of mount, female jockey performance was seen to be equivalent to that of male jockeys. Cashmore said: "This study strongly indicates that female jockeys are every bit as good as their male counterparts. I hope it helps to provide more opportunities for female jockeys, and also encourages more women to further their careers as race riders." France Galop introduced a weight allowance for female jockeys last year and the BHA said it would consider the findings from that initiative along with the views of the recently formed Diversity in Racing Steering Group, the findings of Cashmore's study and its own statistical analysis to determine what action the sport should take to improve equal opportunities. In giving the keynote speech at the Horseracing Industry Conference in London on Tuesday, Rust said: "I personally think that we could see – and this would perhaps have been unthinkable ten years ago – I think in the next five years we might finally see a female champion jockey. "I really believe that's possible because I think there's some momentum building up around opportunity and the type of research that Vanessa has done debunks a myth, I would argue." Asked if he had a magic wand and could change something in the next six months which would have a long-term impact, Rust appeared cool on the idea of adopting the French model. He said: "[We need to] provide a suitable incentive for trainers and owners to properly consider female jockeys and I don't mean a 4lb allowance because, as you are going to hear today, we ride on equal terms. "We are proud that British racing is one of the few sports where men and women can compete on equal terms. However, if female jockeys are not being given the same opportunities as the men, then this cannot be considered as equality. The Diversity in Racing Steering Group was created following the release of a research into gender representation and diversity in British horseracing by Oxford Brookes University, in partnership with Women in Racing. Spokesperson Susannah Gill said of Cashmore's study: "The research takes us one step closer to putting the tired argument about strength and capability on the scrap heap and focusing on changing perception, on changing attitudes and, most importantly, driving behavioural change." She added: "By working together we can ensure our sport welcomes and supports talented people from a diverse background so we can all contribute, on the basis of equal opportunities, to the future success of British horseracing." In 2016 24 per cent of the 778 individuals holding a professional or amateur jockeys' licence were female. 11.3 per cent of professional licences – including apprentice and conditional jockeys – are held by females. In June 2017, 51 per cent of the sport's stable staff workforce was female, up from 42 per cent in 2010. Nearly three-quarters of students at the British Racing School and Northern Racing College were female in the academic year 2016-17. Over the 14-year period of data analysis, which incorporated 128,488 races and 1,255,286 individual rides, female jockeys received just 5.2 per cent of rides – 6.5 per cent on the Flat and 2.9 per cent over jumps. Females jockeys accounted for 1.1 per cent of rides in Class 1 Flat races compared to 10 per cent and 9.3 per cent in Class 6 and 7 races respectively. Over jumps female jockeys accounted for 0.8 per cent of rides in Class 1 races, compared to 3.8 per cent and 5.4 per cent in Class 5 and 6 contests.